Product categories of Rapier Weaving Machine, we are specialized manufacturers from China, Rapier Weaving Machine, Weaving Rapier Loom Machine suppliers/factory, wholesale high-quality products of Fabric Printing Machine R & D and manufacturing, we have the perfect after-sales service and technical support. Look forward to your cooperation! 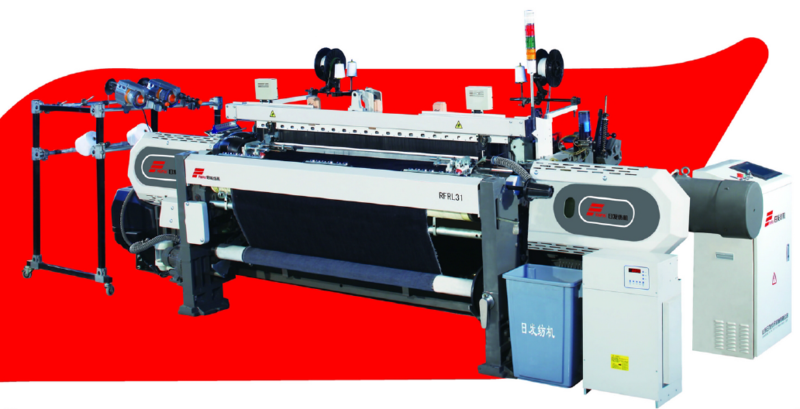 RFRL31 is a high speed Rapier Weaving Machine with wide weaving versatility.The speed is controlled by the most advanced SRD system, it is suitable to weave various fabric such as industrial & percolation fabric, cotton fabric, wool fabric, denim, upholster fabric, silk, linen, corduroy, rayon, synthetic filament, filter cloth, glass fiber etc. Filling insertion rates up to 1350m/minute. reed space range 170~360cm.